News is coming in of a fire in the Greyhound pub in Sydenham. This follows the recent extension of the Sydenham conservation area to include this building and to protect the historic site from developers wishing to demolish the existing building which has many great features. I don't know why the writers of this entry on the Sydenham forum don't just come out and accuse the developers of arson, which is what they are intimating. On one hand, they are suggesting that the developers paid little attention to security, on the other hand they are accusing them of erecting fencing which impeded fire crew access. A load of tosh. I don't think anybody wishes to accuse any individual or organisation of any illegal acts without any evidence (or if they do then they are too sensible to actually write it). The police have described it as suspicious, meaning it could well have been arson. Whether they will find evidence of who committed the arson (should this be established to be the cause) is another matter. Unfortunately this has been the fate of a number of conserved properties in London, while other fall apart. It makes me wonder what the point of conservation is, when the police do nothing about squatters and conserved properties fall apart due to neglect or 'accidents'. Perhaps it would be more sensible to restrict the number of conservation projects and provide the funding to preserve them. Irrespective of the cause of the fire, the developers could not give a toss about a historic building (and irrespective of your views on whether it should have stayed as a pub, or knocked down). So much of Sydenham was lost in the 60s - 80s. Steve G will can give much more details but from my understanding Sydenham had a longer and more glorious history than SE23. If the developers were bothered about the original building they may well have done more to protect it. There is already a mirror with the old reservoir in the posh estate - the building that stood there, following the failure to grant planning permission to redevelop, burnt down one day. And a former employer of mine, with too much production capacity wasn't overly upset when their match factory (Maguire and Paterson) was bombed in the 197Os in Belfast (not that I am suggesting any link, although perhaps some mutant offspring of HRH may be involved). If you are having a go at the Sydenham Society you may as well say similar about Tewkesbury Lodge. Have to agree with BD about the history of Sydenham. My map of 1816 show Forest hill is a small hamlet less than half a mile long, whereas Sydenham stretches for about 2 miles. Its sad to lose any old building, but they all go in the end I suppose. Long term, it is not very rosy for any of us, so let's not go there. The site is historic and the building distinctive and it is under our watch that this is being allowed to happen. The developer should be hit with significant fines, again and again while the building is an eye-sore and insecure. Best way of keeping it secure is to have the pub operational until a decision is reached about the future. I can understand the passion that surrounds this site, however I find the extent of the vitriol against the developer, for being , essentially, a developer, extremely disturbing as is the ensuing loss of reason. Look at the Cutty Sark- despite 24 hour security even this fell victim to crime. The developer here is being accused of both being too lax about security and preventing fire brigade access. So which one is it? No-one is saying that the developers necessarily directly initiated the fire or were negligent in this case, but motive is an important factor in successful prosecutions and I think it reasonable that the investigation into this damage thoroughly investigate this angle. After all firemen's lives are being put at risk, so it is important. I also think it reasonable that the developer should be encouraged to resolve the planning difficulties by removing the financial reward of doing nothing but watch their investment grow. I agree that is a shame that the developers have brought all this ill feeling on themselves just to squeeze out every last penny from the site. "My first impression is of a council estate on Westferry Road near where I used to live on the Isle of Dogs; this too had a darker island building surrounded by "white-washed" flats with shops beneath." Horrible, deeply, deeply horrible! The new buildings are too tall and totally out of keeping with the rest of the street. I guess they are taking their cue from the Cobbs corner building, both for height and colour - but it really doesn't work for me! I think the plans for The Greyhound are a disaster. What do you think The Prince of Wales would say about it , it is hardly Poundbury is it.? Seems to be nearly all the site taken over by ugly squareish buildings. Presume these are going to be more 1 bedroom flats to let or sell. Is not the population high enough already. Where oh where are these people going to work especially after the collapse of Docklands and The City. What would be nice is pub renovated and opened for more up market clientelle. Why build anything else, a garden would be nice. I hope that the Sydenham Society and Forest Hill Society object to this application. I have not seen the full details by the images horrify me. They have taken a lovely pub with significant facilities adjoining and completely surrounded it in 4-5 storey buildings. The developers would describe these are neutral/blank-canvas buildings that do not impinge on the views of the pub. I think this is rubbish. The character of the pub building is completely ruined by this level of development completely enclosing it on two sides and apparently leaving very little pavement on this dangerous road. This is a locally listed building and half of it will be destroyed to preserve a frontage which they intend to restore the original brickwork and stop it from complementing the other buildings in Cobbs corner. If this ghastly conglomeration of old and new is allowed to be built I hate to think what will be built to fit in with Louise House and possibly the frontage of the pools. It appears that the area is being filled up with nasty looking blocks with little consideration for the surroundings or the people who may live in them. What about the hideous, badly finished block on Dartmouth Road near the roundabout at Kirkdale? I can't believe a local authority could allow such a development. 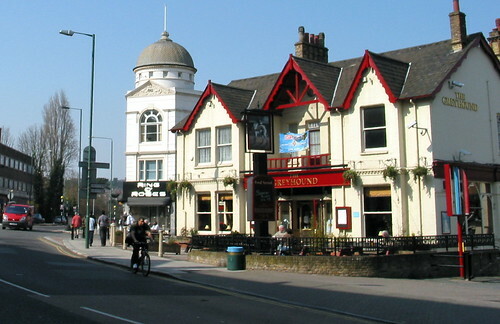 The reason this proposal is a ghastly conglomeration of old and new is primarily the foolish decision to retain the pub in the first place, resulting from nostalgia rather than a cool headed assessment of what the area needed and what type of architecture/streetscape would be best suited. I do wonder what people honestly thought they would get when they campaigned so vigorously for its retention. It should have been razed to the ground(legitimately, honestly, and safely-as opposed to arson), and a new more appropriate new modern development take it place, one which could have mirrored, at least in civic terms, the building on the corner opposite in the panoramic photo and one which would have made the most of a prominent corner site. Sorry, Michael,but I do not recognise phrases such as ' lovely pub' and 'character' as being an accurate representation of the current street scene. The pub was full of 'character' alright -mostly 'characters' out on bail or awaiting sentencing. In practice few situations lend themselves to a satisfactory mix of old and new architecture. The Greyhound nor the Louise House/Pools complex are in this category. There's a terrace chant (for the youngstes reading this terracing relates to the concrete steps that superseded tinder banks that preceded all seater football grounds) that goes "where were you when you weren't 'very good' " (aimed at the new generation of glory hunter football fans, who did not follow the Arsenals of the world when they had ten years of mid table mediocrity, or Chelsea when they yo-yo'd between the old Divisions one and two). Felt like singing this when I saw all the new friends that the Greyhound has now got. Anyway the important thing is its getting publicity. And the other important thing is BD having the moral high ground. This building was open to the public until recently and it has many architectural features that should be preserved, both inside and out. With the exception of Forest Hill Library and Horniman Museum there are few publicly accessible buildings more worthy of preservation. It makes Louise House look very boring and plain, and I cannot believe that English Heritage have not listed this pub. A recent listed building application to English Heritage was turned down. 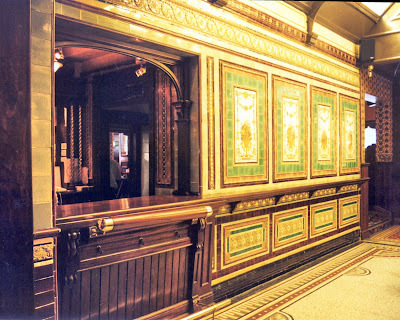 Of the tiled lobby English Heritage state: "Surviving intact, the tiled drinking corridor might have been of sufficient interest to counterbalance the absence of original features elsewhere... however, the owners have begun to demolish the most significant element of the building". If you want to prevent a building being listed, just start tearing it apart. True the interior has some great areas which should be preserved. I agree with those who say they did not reconise the 'lovely pub ' referred to. In all my years locally tended to avoid. Combination of no real ales and the clentelle they attract. If they do preserve it need to go a long way up market. Sorry my posting was out of sync with Roz's or else I would have happily added my three happenyworth. Well a picture paints a thousand words! Well impressed with the interior when I first lived in the area over twenty years ago and as I have bored before home of the Rub a Dub Club where Vic Reeves cut his teeth as a compere (even if he is in denial about this). I'd rather they bulldoze the Dulwich Woodhouse, but that is a separate issue.